Nobel Peace Prize Laureate 2001, former Secretary-General of the United Nations 1997-2006, Kofi Annan Foundation. Kofi Annan recalls the unexpected accolade of being awarded the Nobel Peace Prize jointly with the United Nations (2001). Annan discusses his recent memoir, "Interventions: A Life In War and Peace" and how a career of working toward peace and justice has taught him to value the individual when addressing global issues. Kofi Annan served two terms as Secretary-General of the United Nations (1997-2006), and spent more than four decades within the organization, winning the Nobel Peace Prize jointly with the United Nations for his work for peace and justice in 2001. Through the Kofi Annan Foundation, Mr. Annan works for increased peace and security, sustainable development, and human rights. 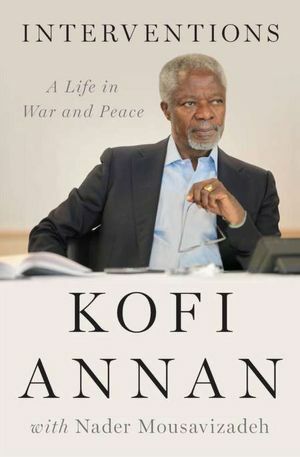 Annan’s 2012 memoir, Interventions: A Life in War and Peace, follows his rise through the organization and his peacemaking work through some of the late 20th century’s most brutal conflicts, in Bosnia, Rwanda and throughout the Middle East. Born in Kumasi, Ghana, Annan attended university in his home country; in the United States at Macalester College, where he received his undergraduate degree, and at MIT; and in Europe. He joined the United Nations in 1962, working for the World Health Organization in Geneva. In 1990, after the Iraqi invasion of Kuwait, Annan helped more than 900 international UN staff and non-Iraqi nationals return to their home countries. From 1995-1996, he served as the Secretary-General’s Special Representative to the former Yugoslavia. 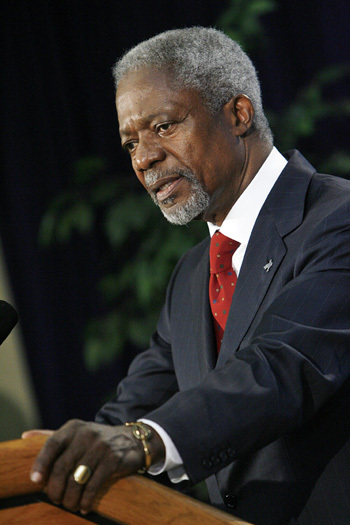 In 1997, Annan was chosen to be Secretary-General of the United Nations. In this role, he helped work to mitigate violence and unrest around the Middle East and Africa, advocated for stronger environmental and human rights standards, and began establishing the Global Aids and Health Fund. Currently, Annan serves as chairman of the Alliance for a Green Revolution in Africa and chairman of the Africa Progress Panel. In early 2012, he was appointed as the UN-Arab League envoy to Syria to end the civil war, but stepped down in August 2012.